After nearly 4 years of developing googleVis on Google Code with SVN we decided to move to GitHub. The main reason was that Google stopped the facility of hosting pre-CRAN builds of the package for user testing. The devtools package on the other hand makes it really easy to install packages from source hosted on GitHub. Additionally, we hope that GitHub will make collaboration with others more effective. Thus, bookmark http://github.com/mages/googleVis. Screen shot of some of the new features in googleVis 0.5.0-1. New functions gvisSankey, gvisAnnotationChart, gvisHistogram, gvisCalendar and gvisTimeline to support the new Google charts of the same names (without ‘gvis’). 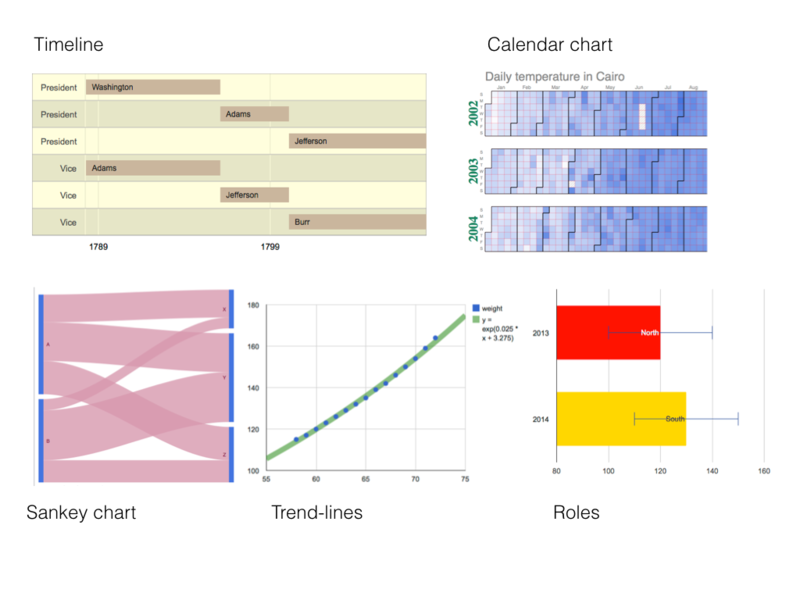 New demo Trendlines showing how trend-lines can be added to Scatter-, Bar-, Column-, and Line Charts. New demo Roles showing how different column roles can be used in core charts to highlight data. New vignettes written in R Markdown showcasing googleVis examples and how the package works with knitr. The help files of gvis charts no longer show all their options, instead a link to the online Google API documentation is given. All googleVis output will be displayed in your default browser. In previous versions of googleVis output could also be displayed in the preview pane of RStudio. This feature is no longer available with the current version of RStudio, but is likely to be introduced again with the release of RStudio version 0.99 or higher. I will post about the new features and changes in the coming weeks. Please feel free to test the development version already. Visit our GitHub project page for installation instructions and further details.